Liverpool Guild of Students, the students union for the University of Liverpool has its main offices and activities located just a street width away from the city cathedral, is a focal point for any student studying at the University. The recent refurbishment of the Guild saw the redesign and incorporation of underground band practice rooms, cinema, dance rooms, bakery class rooms, upstairs included a complete modernisation of the main theatre and the total refurbishment of the dining halls, gig venue and main kitchen. With bars, shops, band nights and social events, the guild is commonplace visit for any student at the University whether its for a lunch time snack or an evening event.The Guild of Students sub brand, the Green Guild, whose aim is to promote sustainability within and out of the university, already recognised by the NUS as leaders in continued innovation in sustainability, had their input into the redevelopment of the refurbishment. 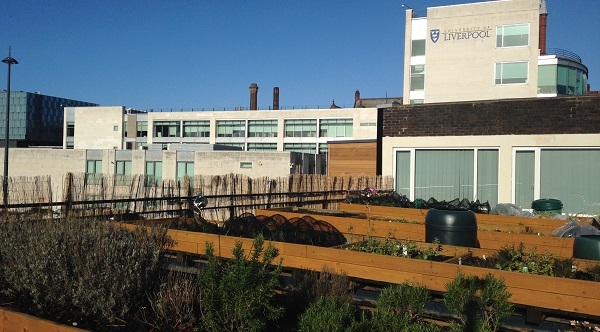 Already roof top bee keepers and vegetable growers, the University and the Green Guild decided a new approach to how their waste was dealt with was needed to accompany the sustainably minded refurbishment. 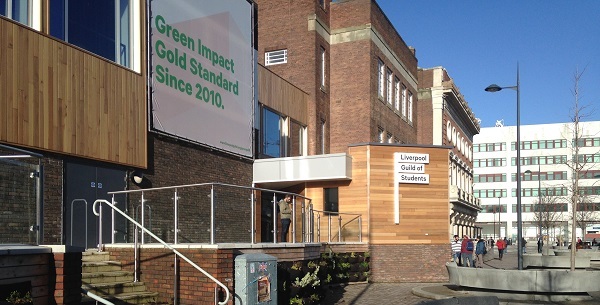 The food waste generated at the Liverpool Guild of Students were without segregation, previously bulked with the general wastes the food was collected as one and destined for incineration. The costs for disposal increasing and with refuse collectors limiting the weights of collections to 80kgs per 1100 wheeled bin, meant that the heavyweight food wastes needed to be addressed. The Guild looked to other Universities and investigated various options in best practice for dealing with food wastes. A meeting was set with the University of Salford, a comparable city centre University, Salford showed the Guild how they dealt with their food wastes, by means of on site Rocket in vessel Composting. Liverpool University, already keen green fingered growers of vegetables had the seeds of an idea, that they too could divert their food wastes from incineration by composting them on site, but with limited grounds for the use of compost could all the food wastes be dealt with in the already tight city centre space they had available? 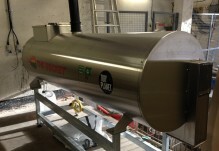 The manufacturers and suppliers of the Rocket Composting systems, Tidy Planet were consulted and a plan with the Guild was put in place. The refurbishment of the guild was to be completed for the end of 2014 and the food waste solution readied and in place for use at the new year. The biggest issue, space versus volume of waste. The Hub needs every inch of space to function, with more recycling being carried out on site the waste compound space was of a particular premium. How exactly would a commercial on site composting system be located with such little space? The initial steps to help overcome the volume issue, Tidy Planet installed a Dehydra food waste dewatering system in the main kitchen, reducing the food wastes by 70% in volume, this system allowed the Guild to implement a much smaller Rocket composting system to treat the wastes. With this reduction in size of composter came the ability to locate the composting system in a previously unconsidered area. The compost produced from the Rocket has already been prescribed several homes, hard to see on a first casual visit exactly how the city centre university could use compost, but take to the roof of the building and you’ll find roof gardens for vegetable growing. 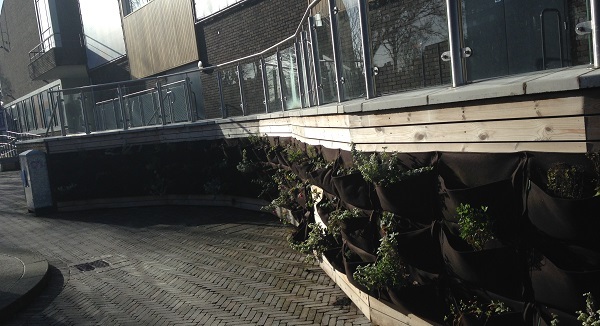 Looking at the side of the newly refurbished building, something even more unusual, hundreds of mini planters. No ordinary planters, this wall constructed from material that was once plastic pop bottles, the planters are irrigated by rainwater harvesting systems, the planters containing herbs, oregano, lemongrass, thyme, mint, rosemary and the odd strawberry plant! A fragrant approach to the entrance to the hub, that will be picked on a regular basis by students on the way home needing some flavoursome addition for that evenings spaghetti Bolognese no doubt. A fantastic innovative approach to dealing with the food wastes generated by the site, one that fits the space and one that surely one that meets with their continual improvement targets. Well Done Liverpool Guild of Students.